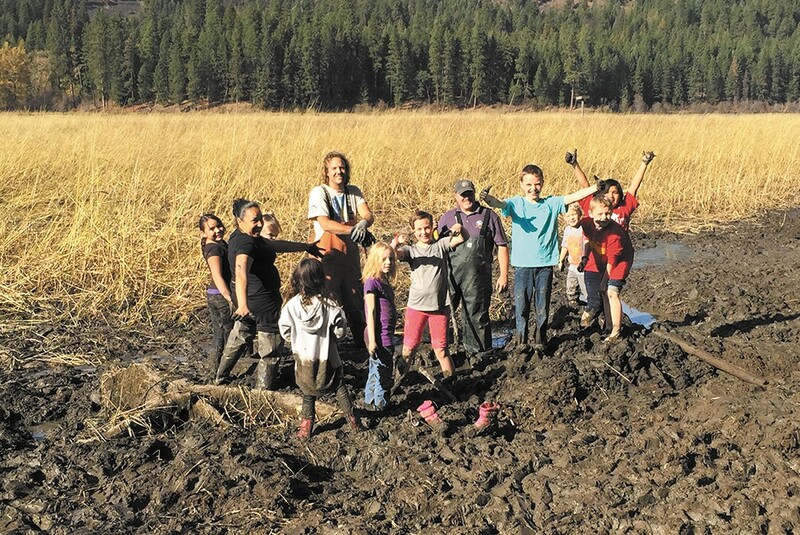 The Coeur d'Alene Tribe offered kids a chance to learn about Indian culture and food through digging water potatoes last fall. Sometimes stepping back is the best way to advance. For the Coeur d'Alene Tribe, that means pre-contact, when they called themselves Schitsu'umsh: "the discovered people." It's a time when eating involved gathering camas and hunting or fishing for salmon, a time when exercise was ingrained in day-to-day life, from dancing to traveling by foot or paddling a canoe. It means qhest life, which translates to a "good, healthy, traditional way of life" in the Coeur d'Alene's Salish-family language of snchitsu'umshtsn. And it's how the Coeur d'Alene Tribe, in partnership with the Benewah Medical and Wellness Center, is encouraging people to fight chronic disease. According to the Centers for Disease Control and Prevention, Native Americans face disproportionately higher health risks — 20 percent greater for heart disease, 14 percent greater for stroke — than all other ethnicities in the United States. A significant factor in developing heart disease is diabetes, which is at least two times as common among American Indian and Alaska Native populations, according to Indian Health Services. "There are serious health problems in the community," says Ken Hoyt, Traditional Foods Coordinator working to develop and implement qhest life initiatives. Hoyt, who is Tlingit, notes two reasons for poor health. "It comes down to either individual choices and habits, or larger structures and systems," both of which qhest life seeks to address. The CDC, for example, advocates convenient access to healthy, affordable foods through larger retail stores, farmers markets and community or home gardens, yet on the 345,000 acres that comprise the Coeur d'Alene Reservation, there are only convenience stores and a lone grocery store. The tribe farms 6,000 acres in wheat, barley, legumes, and canola; much of the remaining 150,000 farmable acres are privately farmed. The qhest life campaign offers a culturally based, three-pronged approach to improving wellness: eat, do and honor. Eat fewer processed foods and more lean proteins and produce by working to introduce more homegrown goods and incorporating native foods, such as water potatoes. Do more active things like walking, running, swimming or structured workouts. Honor heritage through preserving language, respecting elders, valuing education and engaging in traditional activities like storytelling, the arts and ceremonies. "In all of these programs," says LoVina Louie, of the Coeur d'Alene, Okanogan, Colville Lakes and Nez Perce tribes, "our goal is to infuse our culture into everything we do." Louie, whose past leadership roles include developing the innovative Rock'n the Rez program, coordinates the hnqhesnet project, the umbrella program for qhest efforts. Hnqhesnet, from the Salish language for "it is our well-being," started as a Benewah Medical and Wellness Center program four years ago. BMWC is a tribally owned and operated community health center, which opened to the public in 1990 as a unique partnership between the Coeur d'Alene Tribe and the City of Plummer. It serves more than 6,000 patients annually, mostly in Benewah County, but also in Kootenai and portions of Spokane, Latah and Whitman counties. Roughly 400 BMWC patients are diabetic, with plenty more at risk. In addition to diabetes screening and treatment, BMWC has tapped the CDC's significant resources. In 2011, it earned a Small Communities Community Transformations grant of $415,987, followed up by a $671,000 grant in 2014 from the Racial and Ethnic Approaches to Community Health programs. The grants allowed formation of the hnqhesnet team. In addition to Louie and Hoyt, hnqhesnet brought on nutritionist and registered dietitian Brenna VanDalsen and demonstration gardener Becky Walrod, who worked with the One Sky One Earth food coalition at Lakeside Elementary school's Success Center garden. Physical activity is being encouraged through an innovative program called PowWow Sweat. Shedaezha Hodge, an enrolled Navajo, is the team's Physical Activities Coordinator and the face and voice behind PowWow Sweat, which has the goals of increasing physical activity and powwow readiness through traditional dance. Classes are offered at the Wellness Center, and PowWow Sweat also offers instructional videos featuring dancers of all ages and body types, occasionally in their regalia, which was important to the hnqhesnet team. "Let's have real people out there," says Louie of the videos, which were produced by Los Angeles-based StyleHorse Collective. Their video, "We Shall Remain," filmed on the Reservation in 2014, won best music video at the 39th Annual American Indian Film Festival and copies are being provided to the Tribe's 1,600 registered adult members. In winter, when nights seem endless and the chill can cut to the bone, it's hearty fare that fills our bellies best. Summertime, when honey is abundant, is a time to celebrate life in all its sweetness. That's seasonal eating: adapting to nature's regional provisions. It's also key to understanding how and why the body craves different foods throughout the year. "It is our belief that in today's modern world where 'convenience' is the name of the game," says Inland Northwest Food Network's Teri McKenzie, "we have become disconnected from our food and the understanding of its significance in supporting our personal health, the earth and our local economy, to name a few." Many people no longer know how to cook, says McKenzie. That, combined with few opportunities to learn, especially using basic, locally sourced ingredients, prompted the Inland Northwest Food Network to develop "The Seasonal Kitchen: Cooking with the Bounty of the Region." Inspired by writer Jessica Prentice's Full Moon Feast: Food and Our Hunger for Connection, each monthly class features one seasonal food or technique. February's class, inspired by the Hunger Moon, will feature root vegetable dishes; May's Milk Moon leads naturally to a class on using cheese, and September's Corn Moon class will feature breads and traditional grains. "Our hope," says McKenzie, "is that the series will provide participants with the practical skills that cooking requires, but also will inspire them to reflect on their food choices, how and where it is produced, and why any of that matters." Classes meet 6:30 -8:30 pm on the third Thursday at Post Fall's Jacklin Arts and Culture Center. Pre-registration required; go to inwfoodnetwork.org.